I consider myself to be a happy person. I am happy being right here in my home with my family. There is no place on earth better then home with the family. But on the other hand, I am not happy. I see the world around me, hear of countries where children are starving, people live in slums, folks who have lost everything, like the folks in Japan. Our prayers are with all those affected by the tsunamis. I want to do more. I want to help more. There are so many ways you can help. I don't have thousands to give to help the homeless or feed folks who need it but I can donate few can goods to the local food bank. Here is some good flavorful poor folks food. Poor folks know how to cook good tasty food, as we have to make due with what we have. 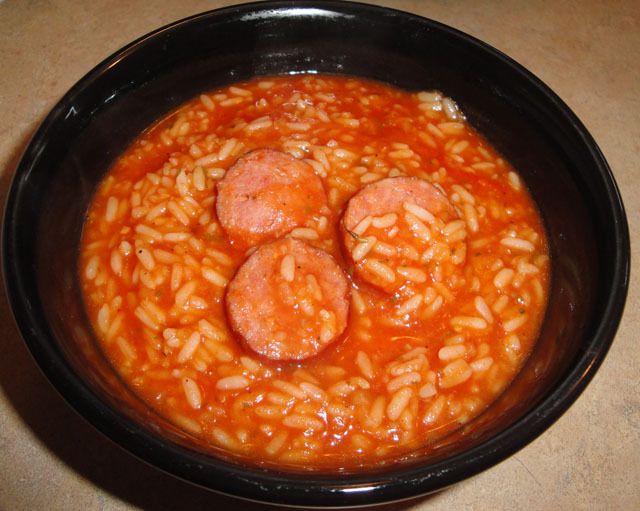 In a dutch oven, add water, rice, tomato sauce, sausage and remaining ingredients. Bring to a boil over medium high heat. Cover, reduced heat and simmer for 20 minutes. Enjoy!